It was a joke on the fishes looking at the watch. Kamburov, Dave_Mc, Bucks and 1 others like this. After 5 months of trial and error with bands, dials and bezels; I have finally found my perfect Amphibia. It is a late 1970s hand-wind mechanism that I have recently had serviced and is now running quite accurately. The bezel, dial and blued hands are all new (ordered from Meranom). The generic brown leather strap will soon be upgraded to a Colareb. I bought it off a street vendor in Bishkek, Kyrgyzstan for around 12 USD, all of the upgrades and servicing was also done in Bishkek by a nice elderly Russian man. PS: Marshrutka for scale. 24h and Dave_Mc like this. igori7 and EPK like this. 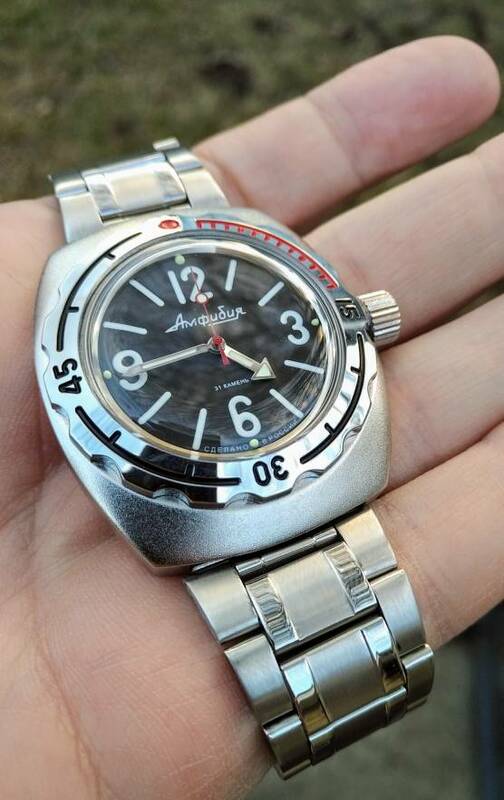 After finding plenty of useful information on these forums I ordered out an Amphibia from Meranom. 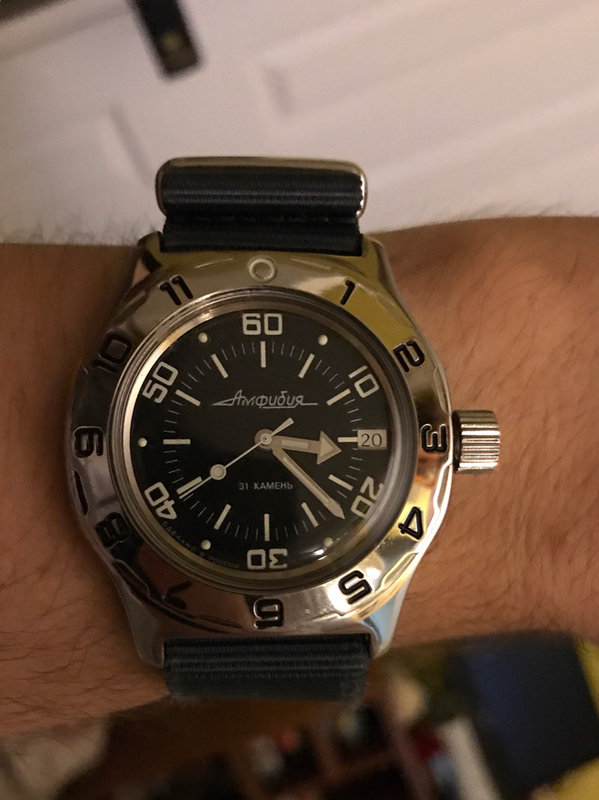 The research paid off as today after I received possibly my first Amphibia. Surprised how fast it was sent out after a few mods that were on the order. It looked like it moved through Russia faster than New York. Tracking was updated this morning and it arrived this afternoon. I ordered the 110903 with the blued hands, black date wheel and stainless crown. The NATO band and brushed stainless bezel were ordered but I installed them right away. A pleasant difference with just a few changes. Thanks for all the helpful information shared. thewatchadude, 69murray and laza80 like this. Welcome to the forum! You’ll find that it is very friendly here, as opposed to some other sections. Great looking watch...careful, it may lead to you wanting another. Thank you but too late, have a few in mind. The only problem that I encountered with the order from Meranom is them sending the parts that were switched out. Having the parts sent with the watch leaves no option but to get another watch to use them. I don't see this ending anytime soon.